Soup Curry is a Hokkaido dish that is a great twist on the regular Japanese curry that we find throughout most of Tokyo. 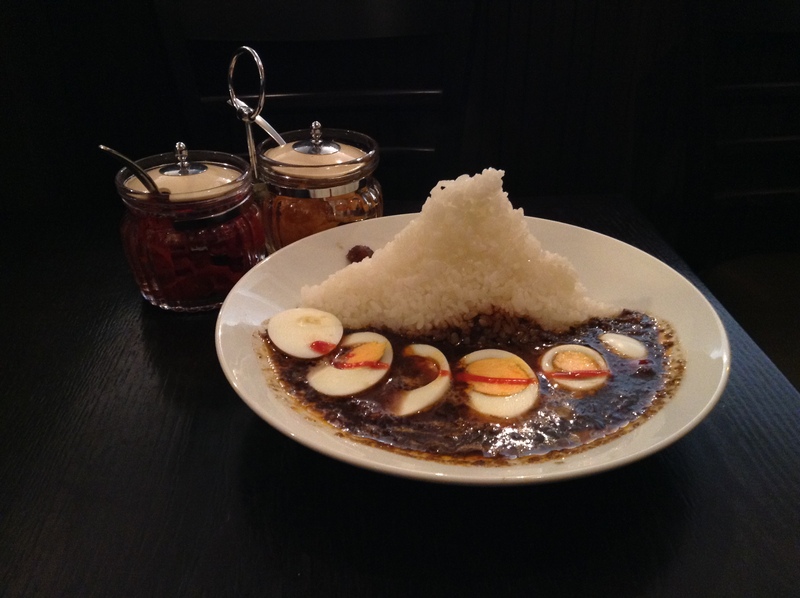 Japanese curry is made with a roux, the flour makes the curry quite thick. The Hokkaido soup version of curry is a soup, without the roux, that is filled with large cuts of vegetables and meat. The first time I was served this was at a girlfriend’s home. I thought she didn’t know how to properly make curry. She explained that this is how the soup curry dish is supposed to be made. It was a nice change to regular curry, that we often make at home. 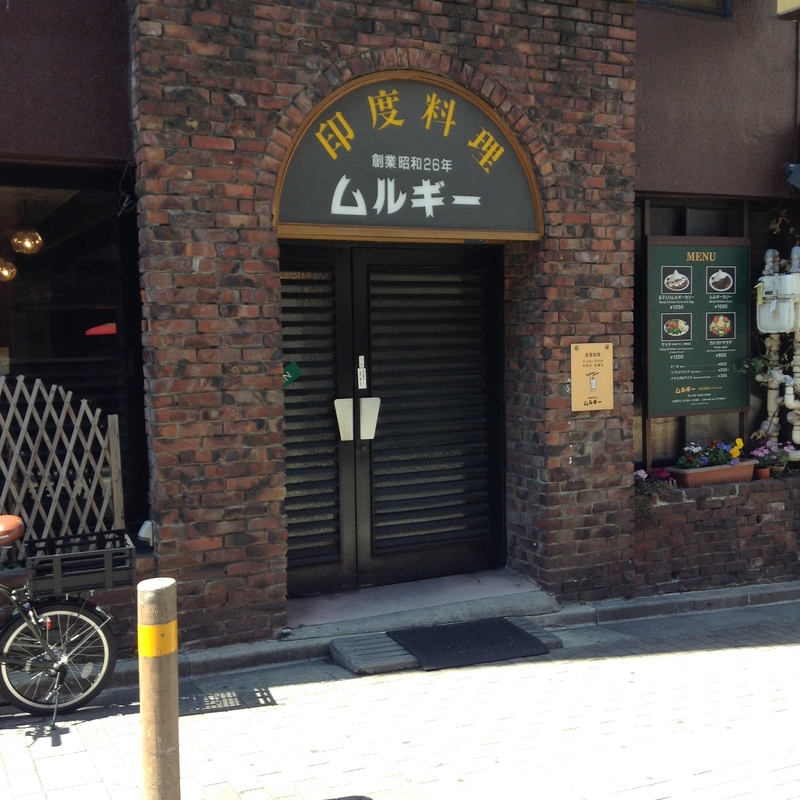 Near Waseda University is a branch of the Sapporo Rakkyo soup curry shop. The soup curry is not very spicy, but you can request to have it made hotter. It is served with rice on the side. 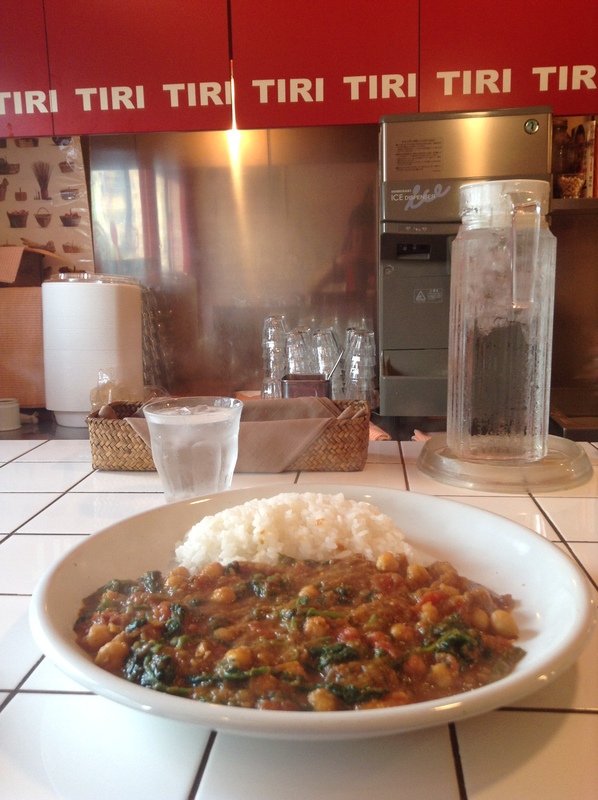 Traditionally thick curry and rice are served in the same bowl. 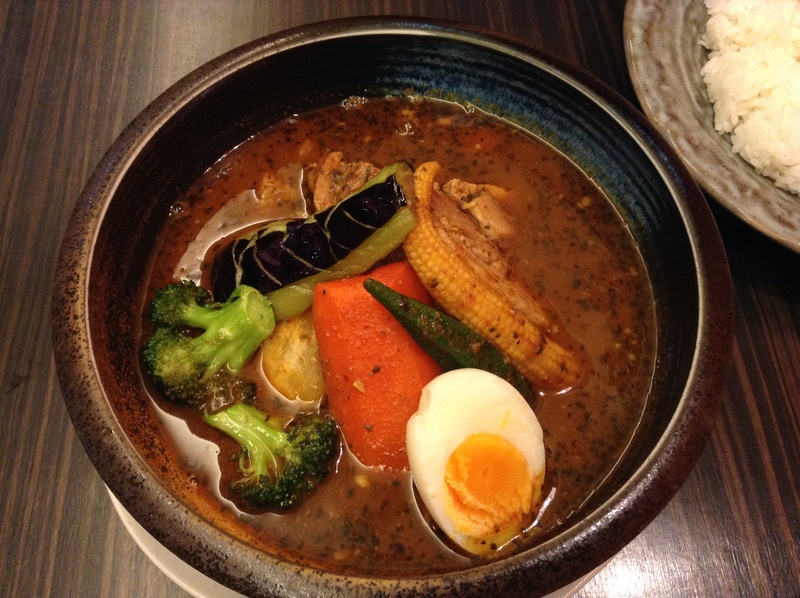 If you like curry, then be sure to try Hokkaido’s soup curry. The Kyobashi side of Tokyo Station outside of the Yaesu exit has many restaurants hidden away down narrow streets or in the basement of boring buildings. Dakshin is one of these spots that is worth seeking out. I only happened upon it as my regular Indian spots for dosa, Dhaba, had a long line out the door. I had come too late in the day, it was just 12 noon and I knew better. Dhaba was not so popular ten years ago. 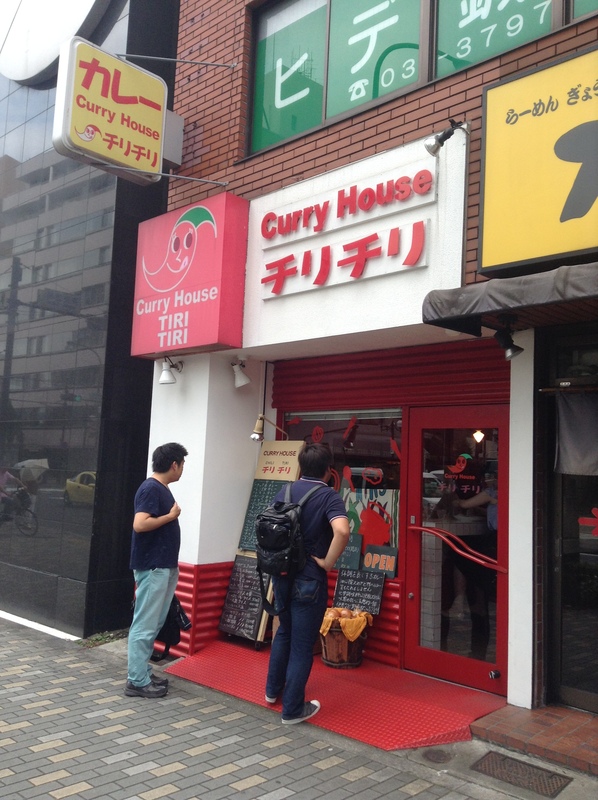 I headed towards Tokyo Station and saw the menu and sign for Dakshin on the street level. “Truly South Indian” caught my attention. I went down the stairs and Dakshin too had a line out the door, but I made a mental note to come back, and am glad that I did. The shop opens at 11 a.m. and I came at about 11:15 a.m. expecting it to be quiet. Was surprised to see the shop already about 1/3 full, and not all the customers were Japanese. While there is dosa on the menu at Dakshin, everyone in the restaurant was eating naan so I followed their lead. I was seated at the counter facing the open kitchen where the naan oven is. I was given the last seat at the counter which happened to be right in front of the oven for baking naan. At first I was excited as it is always fun to see the naan being stretched out, slapped into the oven, only to be later plied out by a long steel tool. But when my neighbors left I asked if I could be reseated away from the oven as it was getting hot. The restaurant filled up quickly after I was seated and by the time I left there was a line out the door. The three curries today were a mutton, lentil, and shrimp. Instead of the shrimp curry I tried a side dish that sounded like onion tempura, I wish I hadn’t. It is best to leave the deep-frying to the tempura masters. 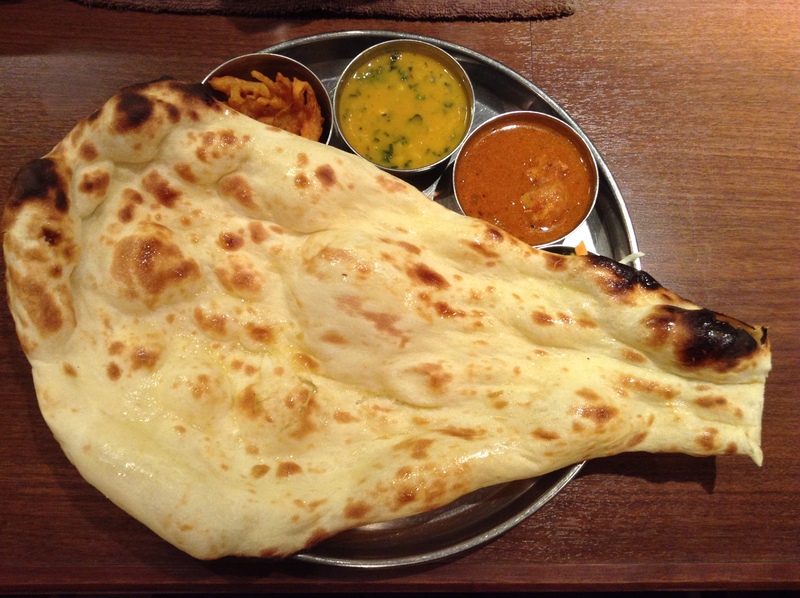 The naan was excellent and served hot out of the oven and the curries also did not seem to be tempered for the Japanese palate. The businessman next to me kept wiping the sweat off of his face with his handkerchief.